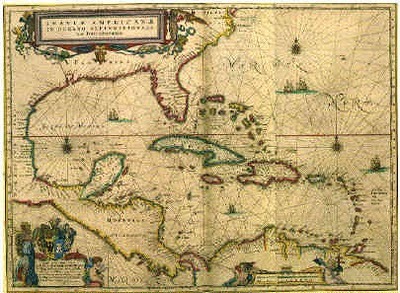 Maps of this era are sometimes called Portolan Charts. The lines to which you refer are intended to be Rhumb lines (i.e. lines of constant bearing). 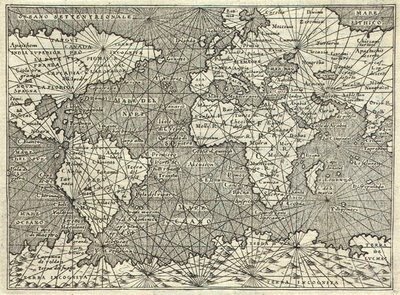 However, early Portolan charts predate the mathematical understanding of Rhumb lines and the Mercator Projection by centuries. At the time, maps were exaggerated and erroneous along the x-axis because there was no accurate method for measuring longitude at sea. The multitude of compass roses with straight lines extending outwards across the map underscores how the maps were shaped by compiling observations from navigators who attempted to follow a constant bearing at sea. Not the answer you're looking for? Browse other questions tagged cartography rhumb-line historical-maps or ask your own question. What is your workflow for designing “antique” maps? Is the Mercator projection or the Gall-Peters projection of the world more accurate? How to display two line traffic road map cartographically? What are all the straight lines on old nautical charts?